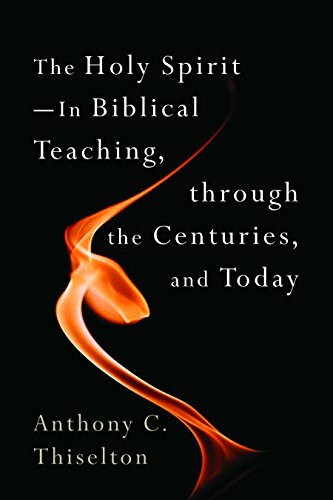 Anthony C. Thiselton began his study with the goal only of exploring Biblical materials and possibly opening some mutually beneficial dialogue with those in the Pentecostal/charismatic renewal streams of modern Christianity. He quickly realized that he needed to explore the literature dealing with this question spanning the timeline from the early church down to the present day. In doing so, Mr. Thiselton has given readers perhaps the most comprehensive and balanced work on the subject. The first section of the book deals with the Biblical text. The author briefly explores the actions of the Holy Spirit in the Old Testament before moving into an informative exploration of the relevant New Testament passages. He looks at the work on the Holy Spirit in the synoptic gospels and in Acts. The major New Testament writers (Paul, John, Peter) each get separate treatment of their teachings. One valuable chapter deals with a detailed discussion of the gifts of the Spirit, a controversial topic today. Mr. Thiselton does an admirable job of balancing the views about the gifts and considering various interpretations of key passages. The second section covers approximately 1,800 years of theological writings about the Holy Spirit. Perspectives from a variety of church positions are considered, from the early apostolic fathers down to the Reformation leaders. This vast body of scholarly works does not allow a great deal of nuance, but key themes are addressed. The last almost one-half of the book brings us into the modern day. We see the first hints of a modern renewal in some of the events of the 1800s, followed by the outpouring that accompanied the Azusa Street revival in 1906. Subsequent chapters bring us into the 21st century, also touching on worldwide Pentecostal/charismatic phenomena. While much of the history presented is both useful and interesting, Mr. Thiselton’s choice of theologians to discuss is sometimes off-putting since many of them analyze the Pentecostal/charismatic renewal movement as outsiders. While knowledge can be gained from observation, the dimension of experience is often missing. One problem may be that there are few truly Pentecostal/charismatic theologians. Many in this movement have an understandable distrust of theologians. But we do see mention of such writers as J. Lee Grady, John Wimber, and Amos Yong. The final chapter in the book is a personal summary of the issues by the author. He attempts to synthesize various streams of thinking and is at least partially successful in this effort. In the end, we are still left with questions that require further exploration and study. The book is well documented with an extensive bibliography of great value to future scholars. The Holy Spirit in Biblical Teaching, Through the Centuries and Today will challenge and stimulate the reader to explore further, whatever his or her religious persuasion.